Let your thoughts take you away as you wear these beautiful gold earrings that have an expression all on their own. The 14K Yellow Gold Monogram Earrings feature a design that is so impressive it creates a work of art out of three simple letters. These gold earrings are simply stunning, matching a classic design with utter originality to produce a timeless piece of jewelry. These gold earrings feature a three-letter monogram measuring 18mm by 15mm in 14k yellow gold. The design of the monogram relies entirely on the pairing of the three letters, which are positioned together in a wonderful display of ornately depicted script. The earrings appear as if a fine thread has been wound around and around to produce beautiful lines and curves to be cast in gold. But if you look closely enough at the earrings, you will immediately recognize the shape of the letters, which have a significance known only to the one who wears the earrings. The earrings also feature a gold push-back, carefully buffed edges, and an overall high polish. 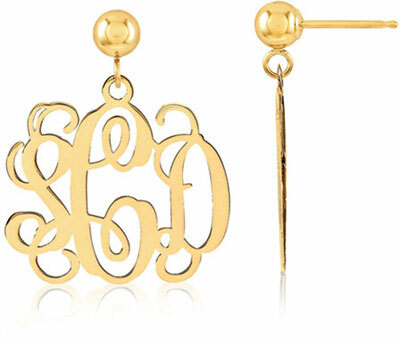 Take the time to admire the creative design of these monogram earrings. They hold a classic appeal because they are the type of earrings that can be worn for so many occasions, and so easily matched with other yellow gold jewelry. We guarantee our 14K Yellow Gold Monogram Earrings to be high quality, authentic jewelry, as described above.